Paul McCobb for Irwin collection display table, model C8707 Comprised of eight equal rectangular 1/4" milk glass slabs on an architectural bridge like under structure. Calvin, 1952. Very few were ever produced and only two have been known in existence. Approximate 4 small chips to milk glass corners, frame has dark brass patina with minor pitting,(can be polished to bright finish) consistent with age and use. 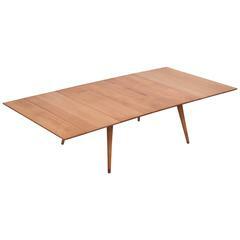 Paul McCobb for Calvin “Irwin Series” travertine top coffee table. Paul McCobb for Directional. 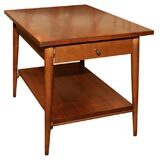 Pair of model 8704 console tables. Square tubular brass frames with travertine top. Patina on brass consistent with age and use. Stool sold separately. 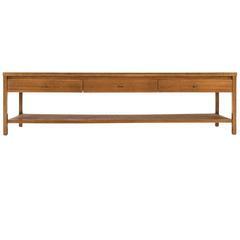 McCobb for Directional, coffee table model 8739, caned shelf, brass edges. Made of travertine, walnut, and brass, this coffee or cocktail table was designed by Paul McCobb for the Conoisseur Collection. Elegant brass and travertine cocktail table designed by Paul McCobb for Calvin. 2 of 2 from the curated collection Space 20th Century Modern. Elegant brass and travertine cocktail table designed by Paul McCobb for Calvin. One of two available from the curated collection Space 20th Century Modern. Console designed by Paul McCobb for Directional. Constructed of brass with travertine top. Excellent condition. A brass and travertine side table designed by Paul McCobb. 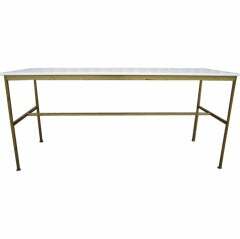 A brass console table with Vitrolite top designed by Paul McCobb for Calvin. A pair of lamp tables with an upper drawer and open lower shelf and Classic solid brass "golf tee" pull by Paul McCobb for Planner Group from Winchendon, American, circa 1950.